On one of those days when winter announces itself to football fans, we were treated to the highest scoring game in the FA Vase, a cup competition that as everyone points out, is the only one where everyone who enters takes it seriously and wants to win. Today was Round 2 and we were off to Eastbourne as the last of the clubs entered this round. 60% of the 572 teams who had put their name in the hat of this seasons competition had already been eliminated. Eastbourne Town are a proper non league football club – the oldest senior one in Sussex, they are bang in the town centre, have a historic turnstile block built in 1914 and their Saffron ground is named after the variety of crocus that used to be grown for use in medicine (ok maybe flowers and football isn’t that traditional, apart from the weeds growing over many forgotten terraces). 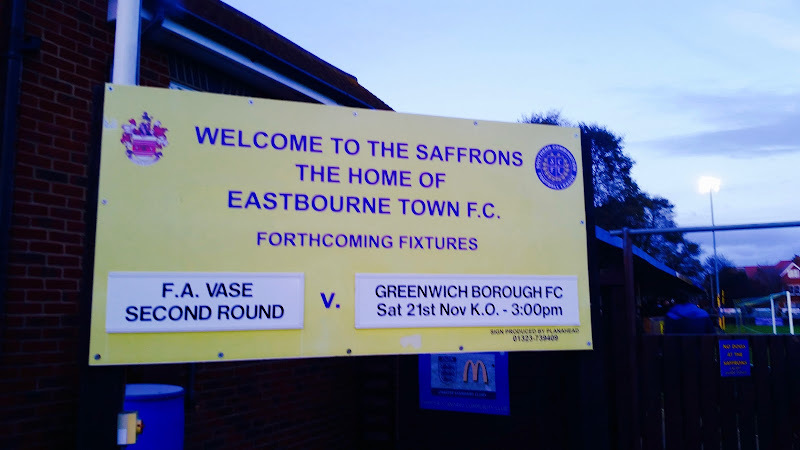 Eastbourne might be known as Gods waiting room, but it is also a hotbed of football; home to not one but 3 teams. It used to be four until Shinewater Association merged with Eastbourne United, and last season that merged team had a fantastic run in the Vase losing in the semi-finals. 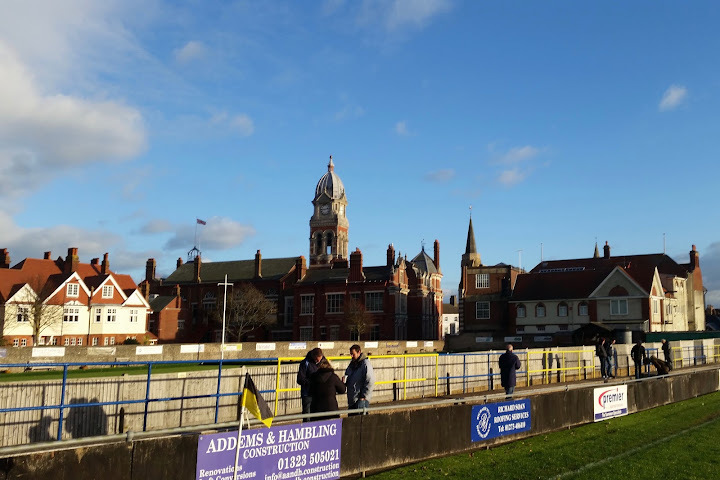 Now in the same division, I heard mumblings all day about their league rivals, but really Eastbourne Town are not you’re average Southern Combination Football League team. Third in the table, second in the attendance figures, spot on with their social media presence they should be in the Ryman League. Infact in 2007 they were promoted to the Ryman pipping Whitehawk to the title. However, they were relegated back down in 2014, but you can tell they get bigger crowds than average cos they have throwaway cups than mugs – and three different outlets to buy food to keep everyone well fed and watered. It was the first time they had ever played their opponents Greenwich Borough, who are second in the Southern Counties East Football League and groundshare with Dartford. ‘Borough’, as they are imaginatively nicknamed, brought along a flag which also bizarrely had Dartford’s crest on it and at least one fan who could do with some lower league etiquette lessons. Eastbourne meanwhile had a drummer but no one to join in with the beats; not to say the paying crowd of 138 wasn’t decent, they just weren’t that vocal. To say that the Eastbourne programme editor likes stats is an understatement; not only could you find out average crowds in their league, how many miles you’d have to travel to watch the rest of the seasons away games (17 to AFC Uckfield since you asked) but I don’t think I’ve ever read programme notes that not only question the oppositions official history, but do their own research and re-write it! As we tried to warm our cockles with coffee and worried that a draw at full time would mean extra time, Eastbourne scored in the 11th minute. But as the first half progressed, Greenwich forwards were causing havoc and deservedly went 3-1 up. But a peach of a goal from Jason Taylor just before half time made it 2-3. Game on. 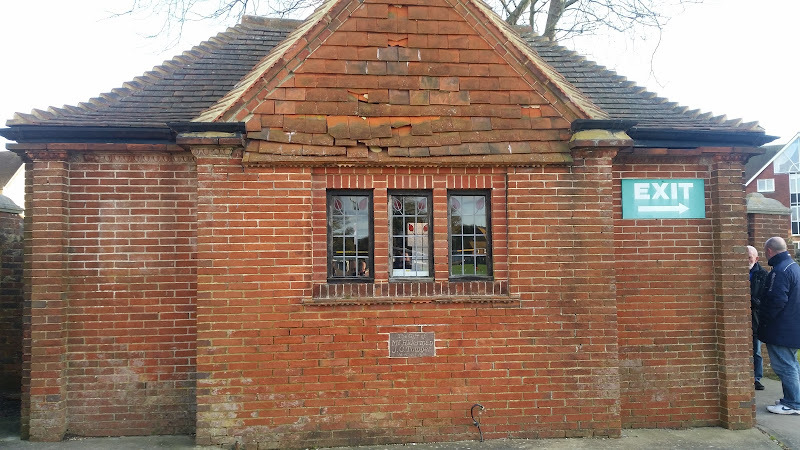 As we defrosted in the packed to the rafters clubhouse (not just with those watching the game, but with two hockey teams; surrounded by cricket pitch and bowls pavilion, this is the beauty of being a multi-purpose sports complex) we wondered if there was a way back for Eastbourne. The second half was even better than the first as Eastbourne clawed back the goal to make it 3-3 before they gave away a penalty to Greenwich who slotted it away to make it 4-3. But Eastbourne forwards were causing all sorts of problems and when Kenny Progue made it 4-4 on 67 minutes, they had momentum. It was well deserved when Aaron Capon nudged them ahead on 72 and they held on for an impressive 5-4 victory. Nine goals for six quid, Eastbourne Town became the last club left flying the flag for Sussex in the Vase. Our cockles as well as our toes were well and truly warmed as we managed to get our train on time. The future for Eastbourne Town looks as bright as the saffron crocus flowers that used to grow there. Words & Pictures: Warren Carter.